The Washed beauty trend, aptly named by the good folks at M.A.C Cosmetics, was plastered across the runways during AW17/18 fashion week. I'm talking Missoni, Dior, Emilia Wickstead, Erdem, Proenza Schouler, Burberry and Lavin to name just a few. The Washed makeup trend is beyond beautiful and the best thing about it? It couldn't be easier to achieve. The trend focuses on minimal makeup and creating simple washes of colour on the face - whether it's blurred lipstick, diffused blush or smudged shadow. Washed is not about creating perfect lines, bold statements or heavy structure, it's about achieving a look that screams effortless beauty. 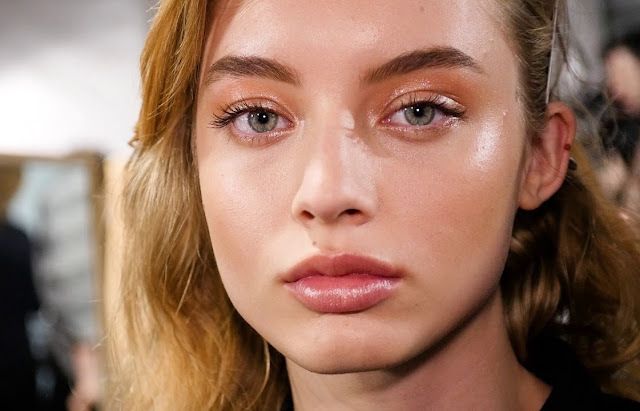 At the heart of the Washed trend is skin - flawless, natural and glowing. Skin is in (in a big way) and enhancing it couldn't be more important. To master the trend you need to start using skincare as your makeup base, natural is the new normal afterall. To best prepare your skin, you need to look for products packed with hyaluronic acid and vitamin C to keep skin hydrated, plump and radiant. Also look for rich moisturisers packed with ingredients like avocado oil, coconut oil or rosehip oil, as skin needs to stay well nourished, especially during the autumn and winter months. If you're hunting for the perfect skincare trio, I recommend the IMAGE Ageless Total Pure Hyaluronic Filler, Sunday Riley C.E.O Protect + Repair Moisturizer, and Perricone MD Multi-Action Overnight Treatment. If you don't feel comfortable going completely commando, opt for a tinted moisturiser or CC cream, such as the It Cosmetics Your Skin But Better CC+ SPF 50+ cream, to give you some sheer coverage that doesn't compromise that untouched look. As for concealer, I recommend something lightweight and hydrating. Benefit's Boi-ing Hydrating Concealer is perfect as it hydrates and nourishes the eye area whilst providing ample coverage. When it comes to makeup, you really need to keep things simple. Highlighting is crucial to the Washed trend and to ensure the look stays as dewy and as natural as possible, you need to look to liquids. I'm obsessed with the M.A.C Strobe Cream in Peachlite as it can be used to highlight the cheekbones, nose and cupids bow but can also be mixed with foundation to add radiance to the foundation's finish. It is lightweight and incredibly pigmented, which made it one of the go-to products backstage during fashion week. There is no set rule for brows and mascara but remember the overall look has to remain soft and delicate, so avoid bold brows and thick lashes at all cost. A brow gel, such as the Eyeko Brow Gel, will provide subtle definition and Revlon's Super Length Mascara will keep lashes fluttery and ultra-feminine. For eye colour, I would look to light shadows with sparkle, such as the YSL Couture Hologram Powder (the shade Laser Violet is sooo pretty!). A lightweight makeup stain, like Benefit's Posietint, works wonders washed across the cheeks and a wet-look lipstick couldn't be more perfect for the lips. I recommend the Too Faced Melted Liquified Long Wear Lipstick in Melted Ruby, as it's easy to apply, uber glossy and creates a gorgeous sheer tint on the lips with just one layer.